I hope the NG gods are kind to you. The only way I can resist clicking the buttons on NG is not to go there – and that’s hard too. I’m glad to read a review of this book, Margaret. I’ve seen it advertised and was surprised by it: I suppose I identify Coelho so strongly with The Alchemist that I can’t imagine him writing anything like this latest book. (And yet I have read at least one other book by him which was nothing like The Alchemist so that’s rather silly of me really.) Anyway, I enjoy good fictionalised biographies. I shall look out for this one. I keep hearing this is a real good ‘un, Margaret. I’m very glad you enjoyed it, too. Looks like I might have to move it from radar to wish list. What a fascinating topic! It sounds very interesting. I haven’t read anything by Coehlo so far but I might rectify that with this one. Thanks. The only Coehlo book I tried to read I abandoned after about 100 pages, so I’m leary of him as an author, but I love the subject matter and would like to know more about Mata Hari. It is an irritating attempt, the nth one by Coelho, to see – with little success and even less ability to persuade – the world through a woman’s eyes. 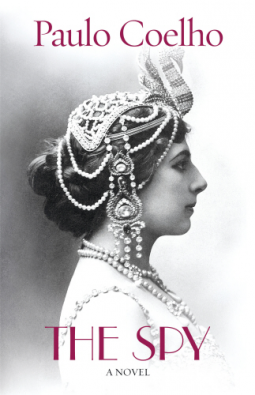 The fiction overtly exceeds the historical facts, and is aimed at giving a parvence of reality to Coelho’s own idea on Mata Hari. In addition, the book is scattered with dozens commonplace reflections on life, some of which excessively boring, smuggled as if they were Mata Hari’s but typically belonging to the author. When Coelho srops considering himself a prophet and comes back to be a human being, perhaps we would be able to raste again the freshness and depth of The Alchemist and few others of his works.